Years ago, when I had only a small Schacht Baby Wolf loom with a mere 24 inches of weaving width, I developed considerable skill with a technique called Double Width Double Weave (hereinafter called DWDW). This allows you to set the loom up so as to weave two layers of cloth simultaneously, open on one side and with a fold on the other. Imagine a sheet of paper folded in half down the middle; when it’s opened up, it’s twice as wide. Hoo hah!! That’s what I did on the loom, enabling me to weave fabrics wide enough to make into clothing, or to make a nice spacious throw to snuggle into on a chilly evening. Not only did I figure out how to do that much, but once I had become enamored of a process of using multiple yarns in a single warp (sometimes as many as twenty), randomly distributed across the width to create complex and interesting results, I began to imagine combining these two techniques. It took a number of attempts — none of them abject failures — before I got pretty good at it, and developed some tricks and procedures that enabled me to be fairly sure that both layers would be as I envisioned. From time to time, at Weavers’ Guild show and tell times, I’d show a length of fabric done this way, and almost invariably — as she stood handling the cloth — some experienced weaver would tell me that it couldn’t be done, or the rules said it couldn’t be done. The evidence apparently wasn’t convincing enough. That’s a close-up of the warp threads tied onto the back apron rod using surgeon’s knots — they’re easy to tie and hold reliably despite considerable warp tension. Each of those bundles is one inch-worth of threads. And this is even closer so the knots and threads show a little better. This is the most jammed-together bunch of warp knots I’ve ever had; I’ll explain why in another post in a few days. It was a bit challenging getting them all nicely aligned and snuggled in together. 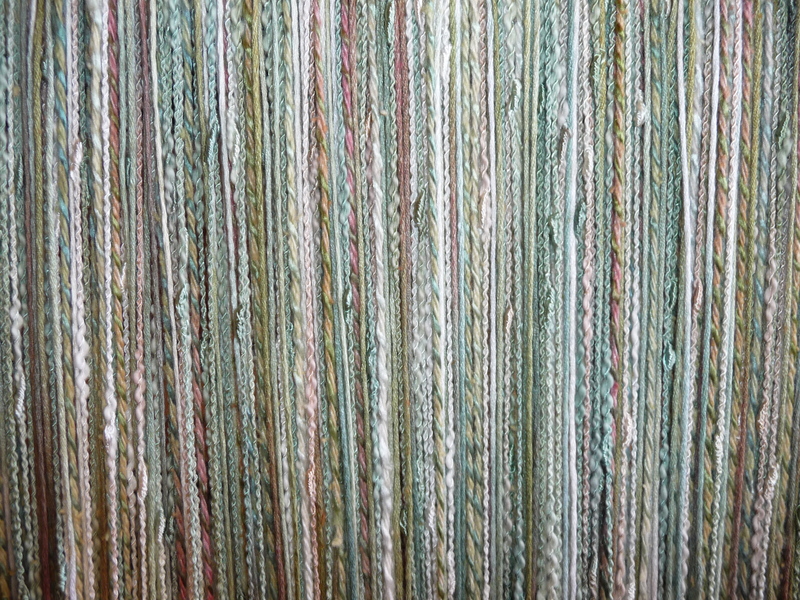 Note — there are 898 threads in this warp, across about 28 inches. 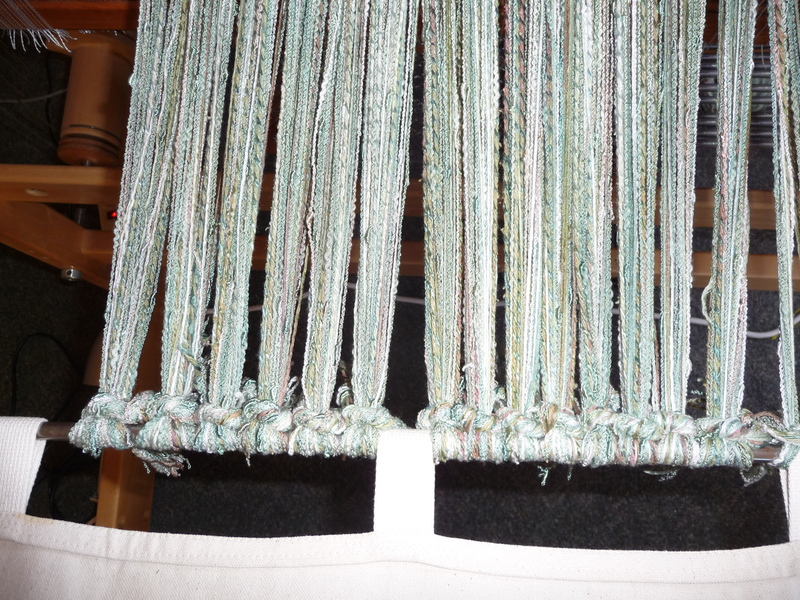 This is an up close and personal view of a portion of the warp as it winds onto the warp beam at the back of the loom. I’m pleased with the distribution of the five different yarns — nice spread of textures especially. I’ll tell more of this story soon. Stay tuned. Can’t wait to see the rest of the story for this warp! I have a 48″ wide loom (having downsized from a 64″) and have been bemoaning the fact that I “can’t” do a proper twin size coverlet for my RV. DWDW gives me the answer I’m looking for! Yowzzah! I can’t imagine doing that, Anne. I mean, I can, and it makes me quail. Talk about tedious. It looks to me that one of the finest features of this piece is going to be the feel of it? Wow! Absolutely yummy looking. Love the colors and textures – as much as I can tell in one dimensional photos. I’ve known that you could do double width though I’d have to see it to really understand how you actually do it! What absolutely delicious colors — no wonder you like your job! 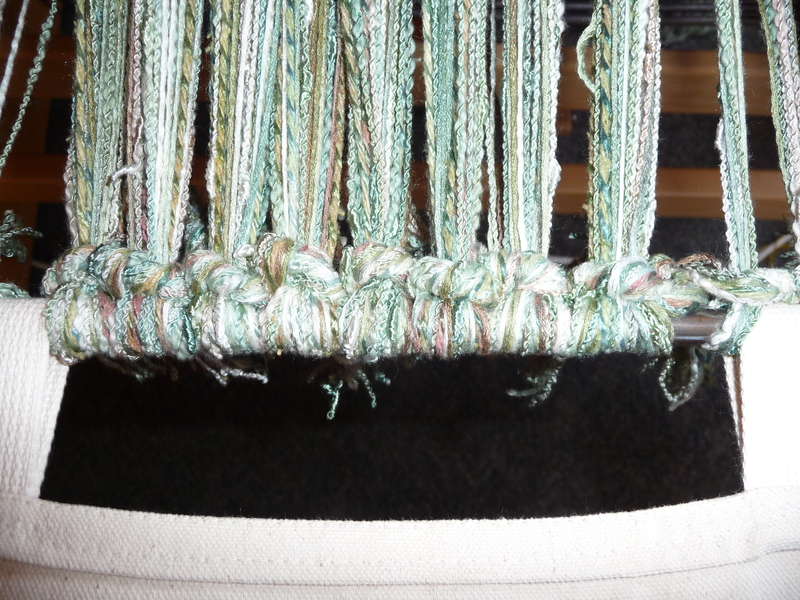 This last warp is 32 threads per inch. Absolutely love the texture. Wonder what the largest number of threads per inch that you, our weaver maven, have magically done? !